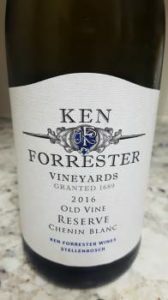 The Old Vine Reserve Chenin Blanc from Ken Forrester Vineyards in Stellenbosch has always offered extraordinary bang for your buck and the 2016 vintage is no different. Grapes from 37 year old vineyards, the wine was fermented in a combination of tank and barrel before nine months of maturation in French oak, 20% new. On the nose, top notes of honeysuckle and fynbos before peach, pineapple and a little bee’s wax. The palate is rich and full, tangy acidity lending balance while the finish is suitably savoury. Substantial despite a relatively modest alcohol of 13.5%. Port2Port price: R100 a bottle.